Brandon Burton claimed his first Grand Prix trophy in style—as thunder raged outside in Indianapolis, he cast three Lightning Bolts to the face, defeating Rob Pisano 2-0. There were tons of tears in tons of faces after the finals finished. A good share of those tears were shed by Mrs. Burton. She watched her son hold the Grand Prix Indianapolis trophy, and she heard the thunderous applause when his name was announced, and she cried for all her son had accomplished—a lot of us did. But for Brandon, this win was no big thing. The man's been grinding the Grand Prix circuit for a long time now, and he knew this was on the horizon. And this weekend he hit that vanishing point. He won the finals in dramatic fashion with a triple-Lightning Bolt to Rob Pisano's dome, and took the crown in two games. No sweat. It was an incredible end to an incredible weekend. Modern continued to show its vibrancy—putting six different archetypes in the Top 8, and basically a 1,000,000 archetypes into Day 2. And it geared us up for the Modern rounds at Worlds this week. In fact, multiple Magic World Championship competitors took the stop over on the way to Seattle to use this as more testing grounds. But it's not Worlds yet. This weekend was Brandon Burton's weekend. And as I'm sure he knows, it's just his first of more to come. Affinity, Bant Eldrazi, Burn, Living End, Ad Nauseam, Death Shadow Aggro, and Red-Green Tron. These are the deck archetypes currently undefeated. Koelten Grissom, Ryan Solave, Mason Linne, Neal Crabtree, Todd Davis, Ryan Normandin and Ryan Whitsitt all brought their “A” games to the first day and were rewarded in kind. But they’ll have a lot of competition to contend with if they want to make it to the Top 8. Three competitors at next week’s Magic World Championships are currently 8-1. Fifth-ranked Steve Rubin, and both fourteenth-ranked Paulo Vitor Damo da Rosa and Mike Sigrist are all in contention. Right along with them are nineteenth-ranked Sam Black and two-time World Champion Shahar Shenhar also at one loss. It’s Modern. It’s the only format where the deck archetype breakdown will show 43% “Other.” We’ll see a lot of crazy decks throughout the day, and surely into the Top 8. So many, in fact, we’ll be giving you not just the Top 32 decklists, but the Top 64! Come join us through the Modern odyssey. Watch the action all day at twitch.tv/channelfireball! Let no one say Modern isn't a roller coaster. Throughout the first day of Grand Prix Indianapolis—with almost 2,000 players competing—the undefeated players aren't just first time 9-0ers, with nary a Grand Prix Top 8 in the bunch, but they are all also playing completely different archetypes.Koelten Grissom, Ryan Solave, Mason Linne, Neal Crabtree, Todd Davis, Ryan Normandin and Ryan Whitsitt are all unscathed, And they are playing (not respectively), Affinity, Bant Eldrazi, Burn, Living End, Ad Nauseam, Death Shadow Aggro, and Red-Green Tron. There are some strong players following up right behind them. Three of the Worlds competitors—fifth-ranked Steve Rubin, and both fourteenth-ranked Paulo Vitor Damo da Rosa and Mike Sigrist—are 8-1. Nineteenth-ranked Sam Black, two-time World Champion Shahar Shenhar are also sitting at only one loss. Here in Indy, Modern has been once again showing its variety, its depth, and its fun. And we've still got six more Swiss rounds and a Top 8 tomorrow before we send you off to the Magic World Championship in Seattle. Tune in to twitch.tv/channelfireball tomorrow to see more Modern standouts doing their things! 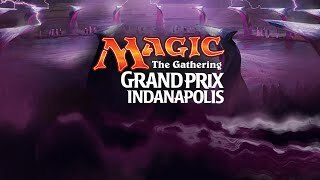 The hashtag for Grand Prix Indianapolis is #GPIndy. Join the conversation!